HOW I GOT THIS BOOK: Requested a review copy from Harper Collins in exchange for an honest review. Thanks a lot guys! She moves forward with mincing steps in time to an air inaudible to all but her, as if in precise synchrony with a phalanx of other dancers. But she is alone. Weeping and wailing she beats her breasts rhythmically. She passes by—a mourning sleepwalker moving in measure like a male Muharram dancer in a penitential procession in Karbala—bearing the unbearable weight of her dead child as though it weighs nothing at all. 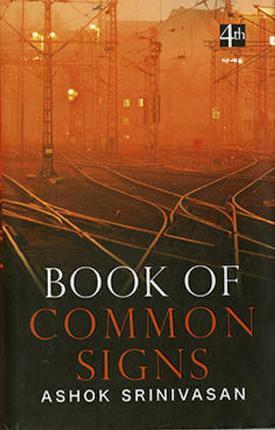 An evocative collection of thirteen short stories, Book of Common Signs is set among the women and men who inhabit the streets and by-lanes, the high-rises and hutments of middle-class India. Passionate, seductive and pulsating with raw energy, they break the boundaries of life and art to inhabit a landscape that is a metaphor for the dark anxieties of their own minds. Ashok Srinivasan explores the human condition with clarity and compassion. In ‘Mother and Child: Charcoal on Charred Paper’ he tells us the story of a married woman whose life unravels after a miscarriage as she finds solace in the love of another woman. In ‘Not to Be Loose Shunted’ he narrates the story of a young man coming to terms with the absence of a missing father. ‘Ex-votos for a Mask Maker’ is at one level about Srinivasan’s own anguish as a writer—telling the tale of a playwright whose dramatic characters come to life in order to destroy him. Elegantly crafted and richly layered, these are stories of profound insight and great emotional power. A book of short stories is not exactly my cup of tea. I prefer reading a continuous proper story with proper character development and substance which I always felt that a short story lacked. My bestie/co-blogger, got me interested in short stories after she sent me few written by her. Having met the humble writer at The Hindu Lit for life 2015, I couldn't help but wonder what exactly he had written to win a literary award. It is not every day does a book of poetry or short story sell like hot cakes - Thus landed this unbelievable literary work in a hardbound form. How do I review a collection of short stories that is far more intense, well developed and a literary marvel? The “parameter” method seems to be the best suited method for this book, for a story by story would lead to a lot of spoilers. Depicting various shades of human behavior which would be primarily instinct based and irrationally rational is a close to impossible task unless the writer has understood the very kernel of human behavior. For a man of 70, I am sure this writer’s own life experiences would have been a rich fodder to process as writing – which the writer has marveled at. He claims to be a painfully shy man who procrastinated publishing this book, in a way I felt he did the right thing. With age and experience comes a deep sense of understanding which is very evident in all the stories. There isn't a single story in this book that “slacked” or scathed just the surface. Writing – Portrayal of details and flow of the story line – “flawless” would be the apt term to describe it. Giving importance to minuscule details like surroundings, building structures and clothes of the characters in a short story would ultimately lead the “short” story running to many pages. Filtering, processing and weaving a tale with just the right amount of details which could be vital for the story to convey subtle emotions or imply an action is a herculean tasks. This writer seems to be comfortable with that task. I can’t think of a particular story that lacked or had an overdose of minuscule details. The detailing in fact aided the progression of the story line in almost all the stories. To quote an example, in the story “ In the Wake”, the protagonist Ambaal, loses her husband (he commits suicide? ), the writer describes the surroundings in depth which very simply convey the gloom that has come upon Ambaal. The attention to minute background details beautifully delivered the emotions that could be expected out of death and loss. The language used was really simple. I was dumbfounded that such simple language could be employed to pack more than just a punch. The cover depicts diverging tracks in a crimson-black combination, which to me actually signifies the entire spectrum of human behavior ranging from compassion to insanity. Though the writer manages to various shades of human behavior, he has concentrated more on the darkness. All the stories are depressing in a luminous way. In sense, there is a rather blurred line between reality and illusion. Almost all the stories dangerously hover around that line, which I wasn't really comfortable with – that would be my only complaint. The writer has dedicated the book to people afflicted with war and have borne much more than just the hard reality of life. I believe he has done immense justice to this dedication. This is definitely not the work of a debut writer. Ashok Srinivasan began writing at the age of 14, and after courting obscurity for decades, finally decided to publish his collection of short stories Book of Common Signs.